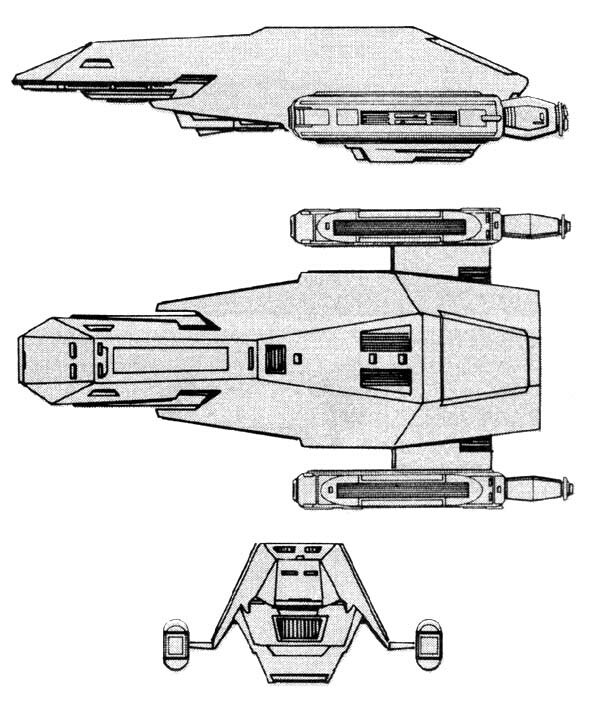 The K-4 gunboat/corvette, one of the most maneuverable vessels in known space, is designed to perform two different missions: in-system patrol duties or outpost/border patrol duties when acting as a gunboat, and rapid attack in mass assaults when acting as a corvette. When operating in its gunboat role, the K-4 carries a squad of six marines who are beamed aboard vessels that come under inspection, where they maintain order while the ship is being searched. The vessel’s usefulness as a corvette is exemplified by a search-and-destroy mission led by admiral Zantai Kaneida. On Stardate 2/1811, a small group of Klingon warships, including 25 K-4s, entered the Triangle to destroy or capture any Romulan forces they might encounter. This force enjoyed great success by using variations on a tactical plan, created by the Admiral himself. The plan called for the destroyers to meet and pin the enemy while the cruisers could maneuver into firing positions. When the cruisers began firing, the K-4s would rush in, concentrating their fire on single targets, then zoom away, only to come back again after another target. Whenever a target ship was assaulted by the K-4s, it was under such intense fire from a capital ship that it could not afford to redirect its fire into so many smaller targets. This tactic proved so successful that, although the mission lasted until Stardate 2/2009, only one cruiser, two destroyers, and seven K-4s were lost. Because of this, similar groups were formed and operated along Federation borders and within the Triangle until well into the 2320s. Of the 941 K-4s built, 106 As, 63 Bs, 38 Cs and 44 Ds have been destroyed; 8 As, 3 Bs, 4 Cs and 6 Ds have been captured by the Romulans, 4 As and 5 Bs have been captured by Star Fleet; 1 A, 2 Bs, and 1 D have been captured by the Orions. 3 As, 7 Bs, 6 Cs and 9 Ds are listed as missing. 2 As, 2 Bs, 50 Cs and 100 Ds have been sold to ranking families within the Empire. 100 A’s and 100 Bs were sold to various interests. 83 Cs and 102 Ds are in reserve fleets. The K-4 was manufactured at losia, Gnuu Re’, Fonawl, and H’rez. The highest rate of production was 50 per year. The class is named from the translation of the Klingon kl’xenova.